The Greeks knew a lot more than we do about insanity. If someone has either temporarily or permanently a perception of reality which is seen as markedly different from everyone else's in their community, they are today diagnosed as e.g. bipolar, schizophrenic, paranoid, or suffering from senile dementia. 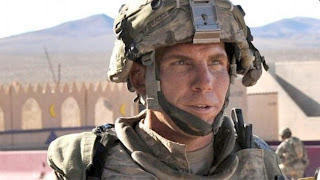 In the case of US Staff Sergeant Robert Bales, who has just been sentenced to life imprisonment without parole for murdering 16 villagers in Kandahar, Afghanistan in March 2012, his lawyers said he was suffering from Post Traumatic Stress Disorder. 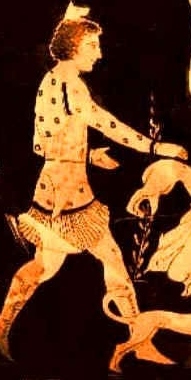 But the Greeks would have been quite clear that he had been assailed by Lyssa, the goddess who makes warriors behave like rabid dogs, forget whom they are killing and why, and 'lose it' in crazed fits of violence on the battlefield (or often, like Bales, far away from it in an assault on women and children). Lyssa was not the inspired madness sent by Apollo which allows the truth and the future to be divined. It is not the mania of the attendants of the wine god, Dionysus, which blurs the line between fantasy and reality. It is not the vengeful bloodlust of the Erinyes or Furies, personifications of the mental changes which people undergo when their loved ones have been murdered. It is not the heightened emotional sensitivity of girls in the early months of achieving fertility, changes overseen by Artemis. Lyssa only attacks trained killers like Heracles, who in Euripides' tragedy murders his wife and three small sons. In his psychotic delusion he thinks they are the family of his deadliest enemy. In the story of Troy, the trained killers whose anger management issues suddenly explode into 'insane' violence are all members of the army of occupation. Achilles starts sacrificing innocent youths on funeral pyres. Ajax attacks his own generals, or so he thinks: he is deluded and attacks their livestock instead. Odysseus comes home and kills a hundred local islanders because they have helped themselves to his larder. I am not a pacifist. I think I could probably retain my sanity after shooting someone trying to kill my family. People defending their own have always coped far better with combat trauma than soldiers sent off to distant lands for ill-defined reasons by cynical leaders. This is why all the PTSD in Greek myth happens to men like Bales--invading warriors rather than members of the home team. Such incredible wisdom could usefully be borne in mind today by the creators of foreign policy. His early medical work was laboratory research on central nervous system cells in and after strokes, but after suffering a stroke himself and hard times thereafter, he joined United States Department of Veterans' Affairs outpatient clinic in Boston, MA. While he worked there, in his words, "[t]he veterans simply kidnapped [him]," and his work with them "utterly redirected [his] life." With this, in 1987, he shifted from neuropathology to the still-developing study of Posttraumatic Stress Disorder (PTSD). He has written two books on the nature and treatment of PTSD, Achilles in Vietnam: Combat Trauma and the Undoing of Character and Odysseus in America: Combat Trauma and the Trials of Homecoming, which discuss the nature of the condition by reference to the experiences of American veterans of the Vietnam War, and the experiences depicted in the Iliad and the Odyssey. He is a passionate advocate of improved mental health treatment for soldiers, and more vigorous effort to prevent PTSD, and has cited classical Greek theater and the collective mourning described in the Iliad as possible precedents. He writes of "the communalization of trauma."